Distänt Mind is the new release from Brigitte Handley’s solo album, The Edge of Silence. The song features a layering of strings and guitars intertwined with pop overtones. Imagine a time and a place where dreams are first imagined… create some distance and step into a new space. Two worlds trying to relate to one another like a Distänt Mind. 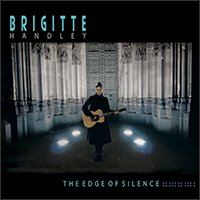 'The Edge of Silence’, the new album from Brigitte Handley, is available here now and through Halb-7 Records, distribution through Broken Silence, Germany. Brigitte will release her new album, ‘The Edge of Silence’ on CD 21 October 2016 through Halb-7 Records, distribution through Broken Silence, Germany. ‘The Edge of Silence’, includes interpretations of Dark Shadows songs that began their lives on the acoustic guitar and features a version of Kraftwerk’s, ‘The Model’, which was just debuted by David White on BBC Cornwall UK. The music is a blend of vocals, acoustic guitars, synths, keyboards and bass. Brigitte will be on tour to launch the new album with a string of dates throughout Europe including Italy, Germany, Netherlands, France and Belgium performing an acoustic set including some new tracks and a selection of acoustic versions of Dark Shadows songs from ‘The Edge of Silence’ album. 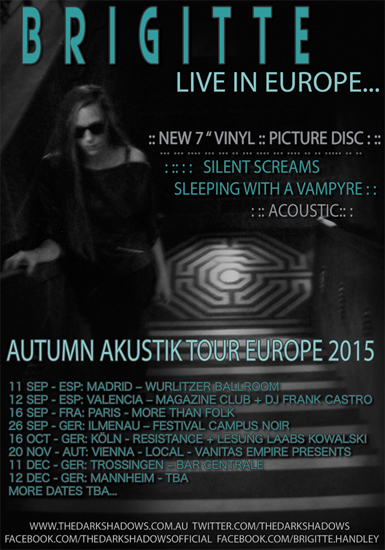 Brigitte from The Dark Shadows will be live in Tokyo and Europe performing atmospheric solo acoustic shows to promote the singles and film clips for 'The Boy From Berlin and 'Silent Screams' as well as the new purple coloured vinyl limited edition pressing of the album, Autumn Still... Available now on Halb-7 Records Germany. Video animation and direction by Sam Wickham. 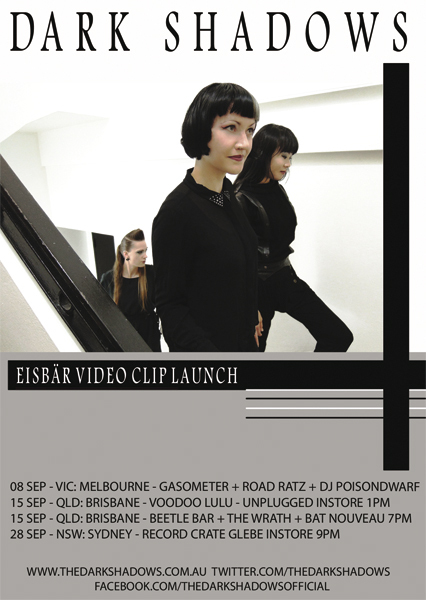 After the success of their recent live performances and sneak preview film clip screening at the MONA (Museum of Old and New Art) Cinema in Hobart Tasmania, The Dark Shadows are happy to celebrate the launch of their new film clip to their single 'Nobody Knows' from the Autumn Still... album. Filmed & directed by independent film makers, Strongman Pictures Entertainment (MurderDrome, Eisbär film clip). 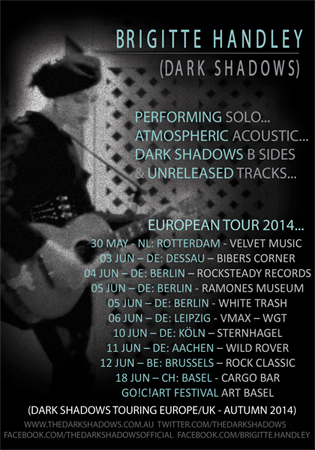 Brigitte Handley, will be in Europe this June promoting The Dark Shadows album 'Autumn Still..' and tour scheduled for October 2014. 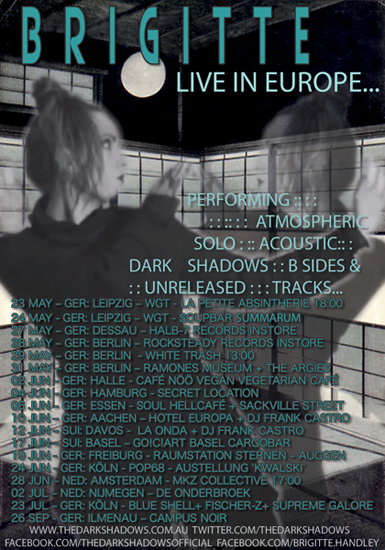 Brigitte will be performing some exclusive solo atmospheric acoustic sets including stripped down Dark Shadows B sides, unreleased tracks and a few other surprises… Appearing instore at Velvet Music, Rotterdam 30th May, Bibers Corner, Dessau 3rd June, instore at Rocksteady Records Berlin Wednesday 4th June and at the new White Trash Thursday 5th June, Friday 6th June at VMAX, Leipzig Germany during the WGT Festival, Tuesday 20th June in Köln at Sternhagel, Wednesday 11th June The Wild Rover, Aachen, Germany with DJ Papst Pest, Thursday 12th June Rock Classic, Brussels Belgium and in Switzerland at the Go!C!Art Festival Basel in the Cargo Bar Wednesday 18th June along with DJ Castro as part of one of the worlds most prestigious art fairs - Art Basel Switzerland. 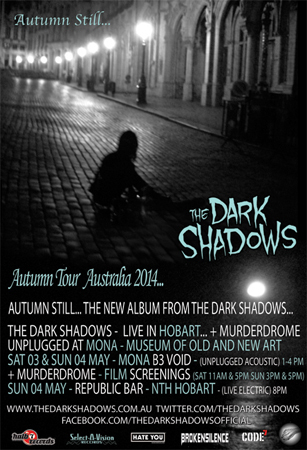 Come meet with us in the Autumn Still… in Hobart, Tasmania 3-4th May where The Dark Shadows will perform exclusive live unplugged acoustic sets at the MONA - Museum of Old and New Art in the B3 Void Saturday 3rd and Sunday 4th May 1-4pm. They will also perform a loud electric set at The Republic Bar on the evening of Sunday 4th May from 8pm. ‘Autumn Still…’ is a gathering of 12 tracks together as part a Dark Shadows collective introducing new tracks as well as including the singles previously released on limited edition vinyl that evoke the mood and feeling of the Dark Shadows musical journey and evolution of recent times. The Dark Shadows new album, ‘Autumn Still…’ will be released in Europe and the UK late October on CD and limited edition collectible 12" vinyl including digital download codes through Halb-7 Records, Germany with distribution through Broken Silence (Germany) and C7 (UK). 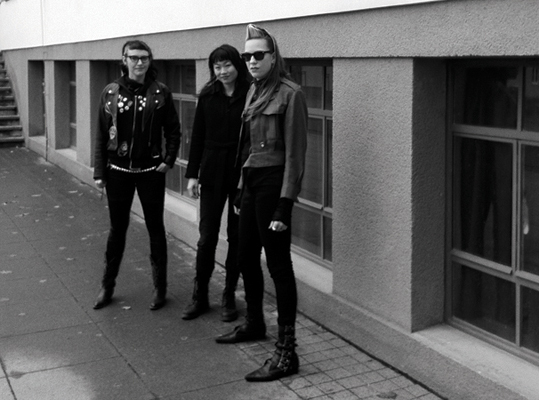 The Dark Shadows have just released a new video for the single ‘Eisbär’ (Ice Bear), a version of Swiss cult wave band Grauzone’s NDW (Neue Deutsche Welle) hit. Shot and produced by Melbourne based film-makers, StrongMan Pictures Entertainment, the Dark Shadows will be officially launching the clip and single in Australia in September where they will perform at The Gasometer in Melbourne Sunday 8th September, an unplugged acoustic instore at Voodoo Lulu Brisbane 1pm, The Beetle Bar in Brisbane Sunday 15th September joined by The Wrath & Bat Nouveau and instore at Sydney's The Record Crate on Glebe Point Rd on Saturday 28th September before heading to Europe/UK for their Autumn tour in October/November. 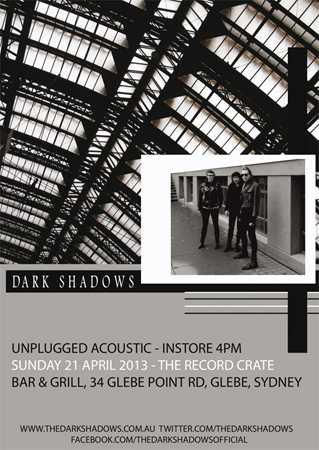 The Dark Shadows will be playing an unplugged acoustic show instore at Sydney's newest and coolest record store, The Record Crate Bar & Grill Sunday afternoon 21st April at 4pm. 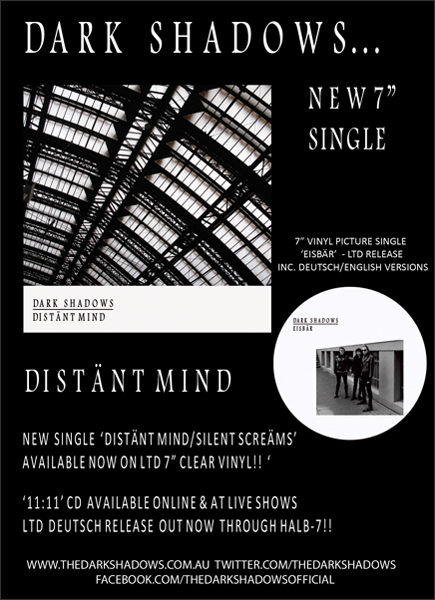 After the success of their appearance at the Wave Gotik Treffen, The Dark Shadows will be returning to Europe/UK in October/November to promote their new single 'Distant Mind' on 7" vinyl as well as their '11:11' EP and the limited edition 7" picture disc ‘Eisbär’. Time for the Dark Shadows to head further down south again... September will see the travelling trio performing in Hobart TAS at the Brisbane Hotel with fellow comrades ‘The Sin & Tonic’s Saturday 8th September and they shall unplug and unleash their Shadow over the MONA (MUSEUM OF OLD AND NEW ART), Australia’s most edgy and controversial art museums, where they will play an **UNPLUGGED SET**. If you haven’t yet heard of the MONA, check it out here: http://mona.net.au/ Well worth the visit to Hobart just for the experience. 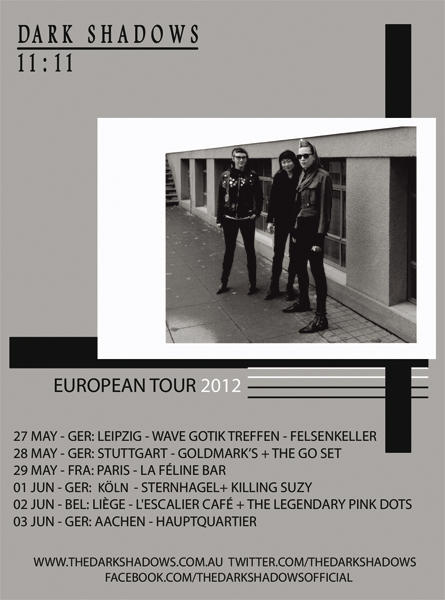 The Dark Shadows have been invited to appear at WGT (Wave Gotik Treffen) in Leipzig, Germany 27th May 2012. They will appear at the Felsenkeller on Sunday 27th May where they will launch their latest single from their 11:11 EP, a cover of Swiss cult wave band Grauzone's song 'Eisbär' (Ice Bear). A limited edition 7" vinyl picture disc of the single will be released for the European Tour including original German language version as well as bonus version sung in English. This will be available exclusively at the live shows. The Dark Shadows 11:11 EP fills the number 3 slot in the UK Rock'n'Roll Magazine chart based on sales at Raucous Records UK!! 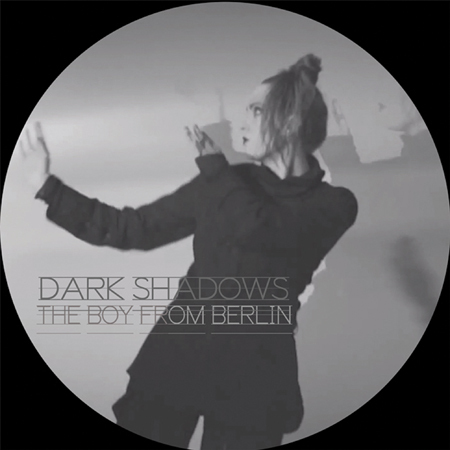 TDS track 'Dark Shadow' - is No. 24 on DOBLE 9 MOST PLAYED 14 Jan 2012 (Lima, Peru). 'Denial' made #33 in the 'Top 100 Most Played 2011' and 'Blame' came in a #58!! Thankyou everyone for your support!! 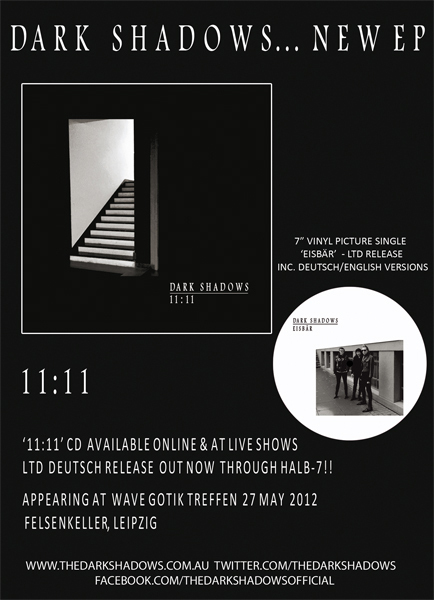 Having just released their new single, ‘Written In The Snow...’ b/w ‘Blame’ on Limited Edition 7 inch collectible white vinyl including Digital Download Codes, The Dark Shadows are launching their new EP, ’11:11’. After the haunting atmospherics of the ‘Invisible’ EP, ’11:11’ sees the band develop this theme and explore a fresh, sharp edged new sound, combined with post-punk noir wave. The new 11:11 EP features 6 new tracks including an English version of Swiss cult wave band Grauzone's song 'Eisbär' (Ice Bear). A limited edition German version of the song will be released in Europe through, Halb-7 Records, Germany. '11:11', also sees one of the band's dynamic live songs, 'Dark Shadow' come to light. Having been a feature part of the live set since the group emerged, they finally feel this take of the song has captured the mood and energy of their live performance. Having just released their new single, 'Written In The Snow...' b/w 'Blame' on Limited Edition 7 inch collectible white vinyl including Digital Download Codes, The Dark Shadows will soon be launching a new EP, '11:11'. After the haunting atmospherics of the 'Invisible' EP, '11:11' sees the band develop this theme and explore a fresh, sharp edged new sound, combined with post-punk noir wave. 2011 has already been an eventful year for The Dark Shadows who were invited to support Scottish indie rockers Glasvegas on their Splendour In The Grass sideshow in Sydney. They also supported new-wave punk legend, Hugh Cornwell from The Stranglers on his Australia wide tour as well as 'The HorrorPops' (Denmark) and Oz psycho metal punk legends The Fireballs on their ' Psychotic Music For Neurotic People Tour ' as well as an appearance at Brisbane's 'Dead of Winter Festival'. 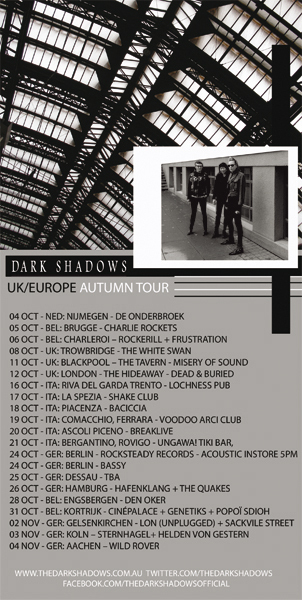 October/November 2011 will be a European/UK Tour for the Dark Shadows who will be appearing at The Semana Gotica Festival Madrid, Spain October 29th and the Whitby Gothic Weekend in Whitby, UK on Saturday 5th November 2011 as well as shows in Tokyo, Japan, Italy, Poland, Belgium and France... more dates to be announced. NEW 7INCH SINGLE OUT NOW - AVAILABLE ONLINE & @ LIVE SHOWS!! The new 7 inch vinyl double sided single, ‘Written In The Snow...’ b/w ‘Blame’, is OUT NOW and available at live shows and online on the official webstore : http://www.thedarkshadows.com.au The record is an independent release on Limited Edition 7” 45 RPM collectible white vinyl including DIGITAL DOWNLOAD CODES for you to add to your digital listening devices! Just back from supporting Hugh Cornwell (The Stranglers) on his Australia wide tour & ‘The HorrorPops’ in Sydney & Melbourne, The Dark Shadows will be touring Australia June/July supporting psycho metal punk legends The Fireballs on the east coast dates of their ‘Psychotic Music For Neurotic People Tour’ . 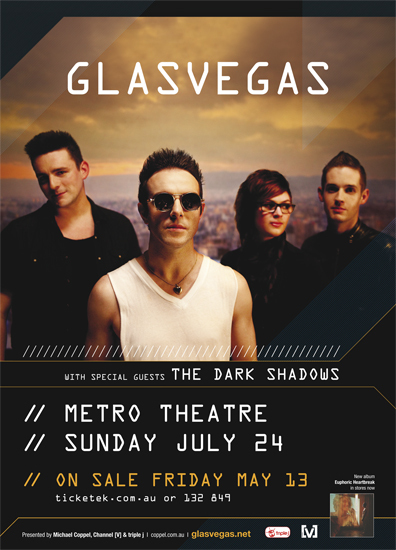 The Dark Shadows have been invited to support Scottish indie rockers Glasvegas on their Splendour In The Grass sideshow in Sydney at the Metro Theatre 24th July . The Dark Shadows will also be appearing at the Dead Of Winter Festival in Brisbane QLD on Saturday 16th July 2011 . The Dark Shadows are excited to announce the upcoming release of 2 brand new tracks for their new independent 7 inch vinyl double sided single, ‘Written In The Snow...’ b/w ‘Blame’ which is due out in June 2011! The record will be released on Limited Edition 7” 45 RPM collectible white vinyl including Digital download codes for you to add to your digital listening devices! 08.04.11 - NEW DARK SHADOWS NEW 7 INCH VINYL RELEASE OUT MAY 2011!! The Dark Shadows are excited to announce that they are currently in the studio mixing off 2 brand new tracks for their new 7 inch vinyl release, ‘Written In The Snow... ’b/w ‘Blame’ which is due out in May 2011! The record will be released on Limited Edition 7” 45 RPM collectible white vinyl including Digital download codes for you to add to your digital listening devices! 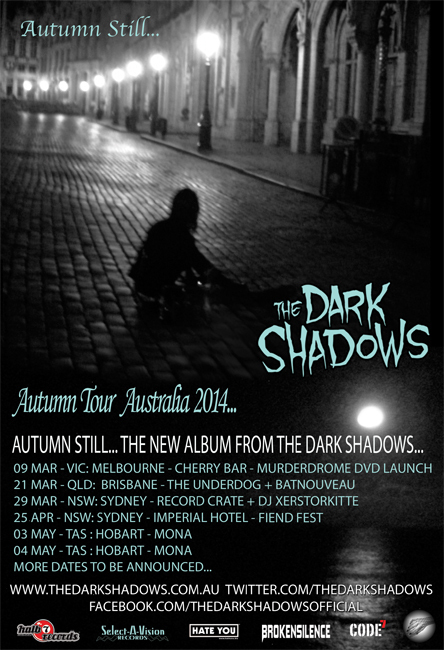 The Dark Shadows will be touring Australia April/May supporting Hugh Cornwell (The Stranglers frontman) on his Australian Tour. Hugh will feature a 2 Set show with his 3 piece band including Stranglers hits & classic solo material plus the Stranglers seminal debut album ‘Rattus Norveticus IV’ played in it’s entirety with Special Guest The Dark Shadows. They will also be supporting The Horrorpops on their Kiss Kiss, Kill Kill Tour in Australia and will be appearing Sun 24 April @ The Factory Theatre, Sydney & Mon 25 April @ The Corner, Melbourne ! Our thoughts and best wishes go out to our friends in Japan and for the safety of their family, friends and loved ones in the midst of these devastating times... The Dark Shadows will return to Japan to help rebuild with hope and music as soon as possible. 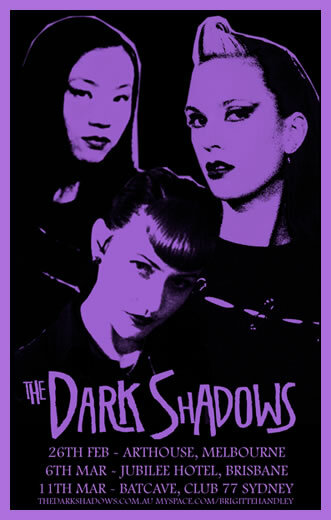 14.02.11 - DARK SHADOWS SUPPORTING HUGH CORNWELL (THE STRANGLERS)!! 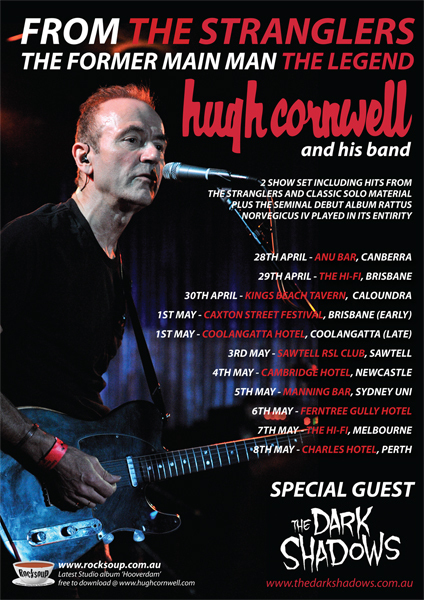 The Dark Shadows will be supporting Hugh Cornwell (The Stranglers frontman) on his Australian Tour!!!! 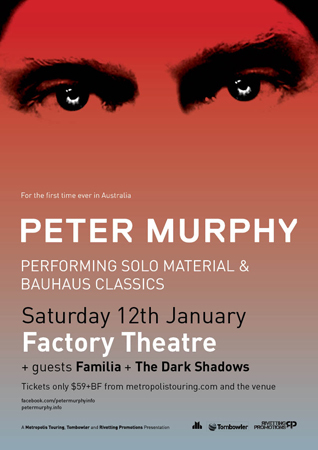 2 Set show with his 3 piece band including Stranglers hits & classic solo material plus the Stranglers seminal debut album ‘Rattus Norveticus IV’ played in it’s entirety with Special Guest The Dark Shadows. Hot off the press – Great news.... The Dark Shadows reached No.1 on George Williams' Top5 Music Show in Japan!! 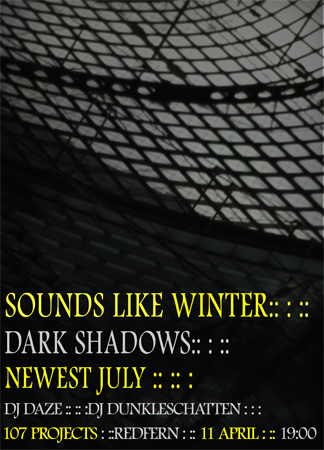 The Dark Shadows will be launching their new EP, 'Invisible', September 23rd 2010. This is the 2nd independent EP release from the band including 4 new tracks and a glimpse of what's ahead with the release of their forthcoming debut album due out 2011. 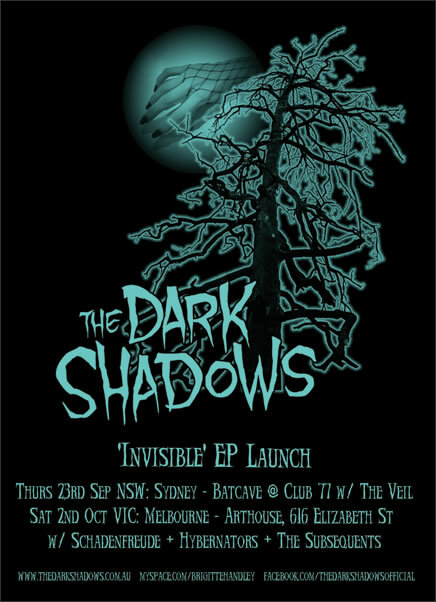 The 'Invisible' EP will be launched in Sydney in The Batcave @ Club 77 Thursday 23rd September with special guests, 'The Veil' and Melbourne, Saturday October 2nd at The Arthouse with 'Schadenfreude', 'The Hybernators' and 'The Subsequents'. After 10 weeks on the road and almost 60 shows throughout the USA, UK, Europe, Finland and Japan, The Dark Shadows are back in Sydney, Australia working on their new release and getting ready for their next leg of Australian shows. The latest tour saw the band play a Rodney Bingenheimer / KROQ FM Presented show in Hollywood CA, suporting the legendary Dutch psychobilly band, 'Batmobile' in The Netherlands and key appearances at WGT (Wave Gotik Treffen) festival in Leipzig, Germany as well as supporting 'Sham 69' at the annual AU Fest, Frankfurt at one of Germany's most famous punk squats. The Dark Shadows made their debut appearance in Tokyo, Japan with talk of a more extensive Japanese tour in the works for later this year. The 'Darkness Calls' CD, a compilation album of the Australian 'Identity' & 'Stand Off' EPs released for Europe, has totally sold out!! There are still limited copies of the 'Identity' and 'Stand Off' EPs available on the webstore. The Dark Shadows are back in the studio finishing off a whole batch of new tracks for a new release later this year. The band has just released their first 'record', a limted edition 7" single on collectible green vinyl. The new single, 'Denial' b/w 'Sleeping with a Vampyre...' is currently being spun on turntables of some of the top underground DJs throughout Europe & the UK. It's also been regularly played by the legendary Rodney Bingenheimer on KROQ FM, Los Angeles CA USA. 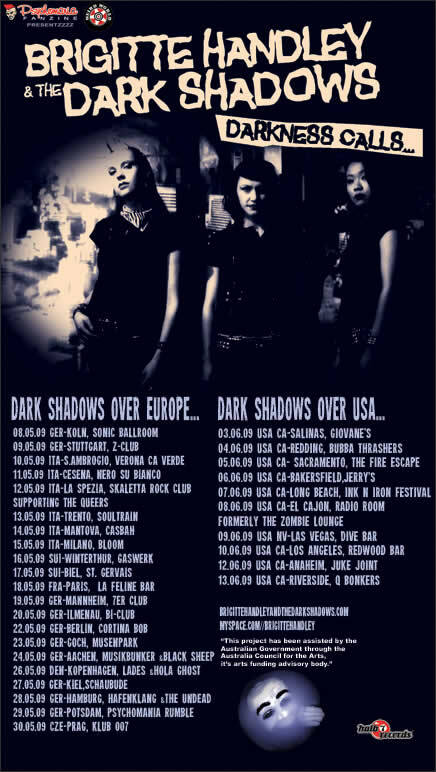 After 2 successful tours of the west coast of the US in 2009, including support slots with Tiger Army & 45 Grave at the Octoberflame festival in Anaheim and appearances at the Ink'n'Iron Festival in Long Beach CA, The Dark Shadows are returning to the US for another tour in April 2010. They will be kicking it off in Hollywood CA Friday 2nd April with a KROQ FM Presents show with The Woolly Bandits, hosted by 'Rodney on the ROQ' DJ Rodney Bingenheimer at Romper Stomper, Hollywood Bar. Rodney has been spinning The Dark Shadows on has show since landing a copy of their debut EP. The tour winds through California and Las Vegas and takes the band to NYC for a couple of shows before heading to Germany to appear at the Wave Gotik Treffen, Leipzig as well as shows throughout the UK and Europe. Yes, the rumours are true.... we have chopped back our name and are now officially, The Dark Shadows. We feel it's a natural progression and has taken shape as the band has evolved and developed it's own personality unified by the contributions and uniqueness of each player together as a whole. We have a new Facebook page under the The Dark Shadows as facebook doesn't allow for name changes so please join up and spread the word. We'll be making updates to both pages for now but will eventually delete the old page. We've been enjoying our break from touring and making use of this time to get back to the creative and artistic side of things, which has given us a fresh perspective and we look forward to sharing this with you soon. The Dark Shadows are back in Australia and busy working in the studio on tracks for a new releas for 2010. 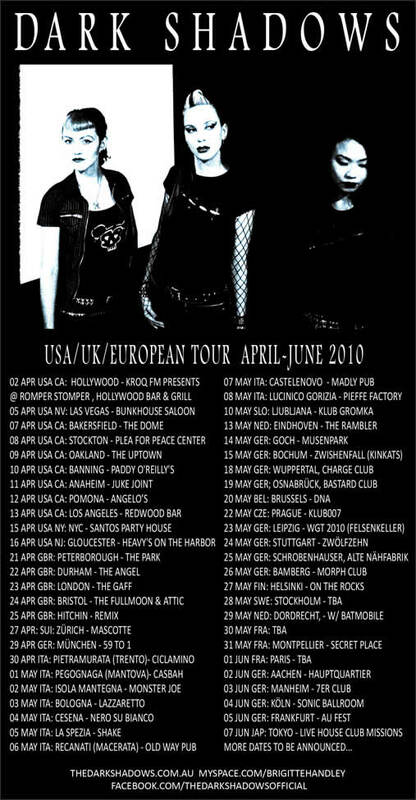 2009 was a huge one for the Dark Shadows with their first tour of Europe, 2 USA tours and as well as a continuous string of Australian dates and opening slots for The Stray Cats, Marky Ramone, Tiger Army, 45 Grave to name a few. The Dark Shadows would like to thank everyone for all their support from all over the world and look forward to sharing more musical adventures with you in 2010.. Thankyou. 20.06.09 - Dark Shadows to Support Tiger Army & 45 Grave at Octoberflame!! The Dark Shadows have just returned from their 'Darkness Calls Tour' which kicked off in Australia, supporting the Stray Cats and Marky Ramone, followed by 5 weeks touring throughout Europe & USA with appearances at the Psychomania Rumble in Berlin, Ink'n'Iron Festival in Long Beach CA, USA. 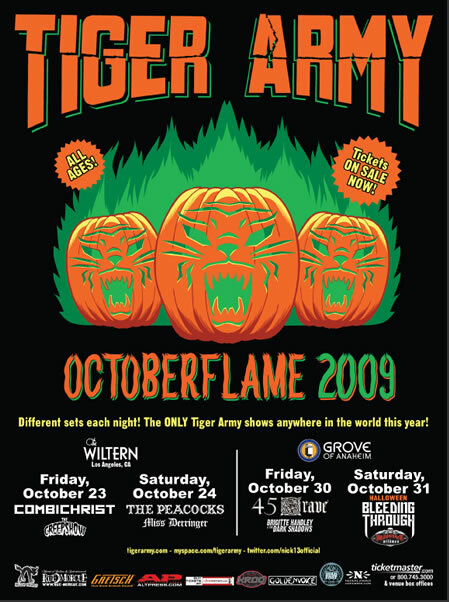 The recent success and attention from this tour has secured the band a return US tour in October 09 including an invitation to open for Tiger Army and 45 Grave at Octoberflame at The Grove of Anaheim, CA USA on the 30th October 2009. 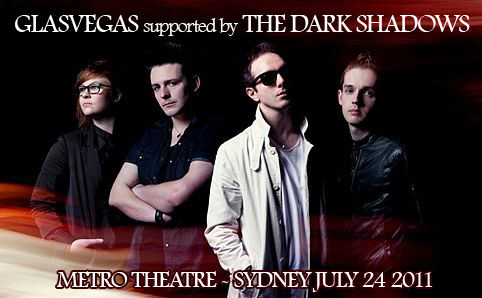 11.02.09 - Dark Shadows supporting Stray Cats - Enmore Theatre 23rd & 24th Feb!!! 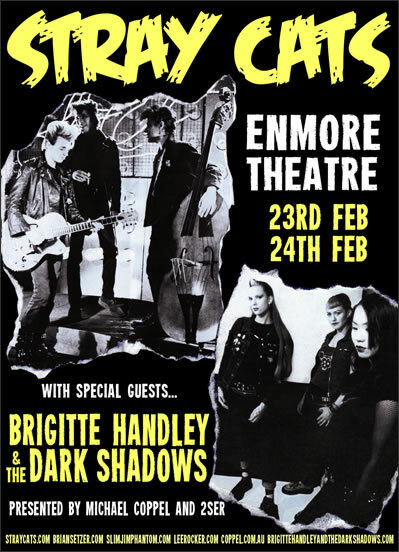 Brigitte Handley & The Dark Shadows are thrilled to announce that they will be supporting The Stray Cats on their Farewell Tour show at The Enmore Theatre in Sydney on Monday 23rd & Tuesday 24th February! !!! Dark Shadows onstage 8pm. 06.01.09 - Dark Shadows wish everyone a Rockin' 2009! Brigitte Handley & The Dark Shadows would like to wish everyone a happy, healthy and rockin’ 2009!! 2008 was a great year for us and we’d like to thank everyone for all the help and support you have shown throughout. We’ve got a lot of very exciting stuff coming up this year with more tours in NSW, VIC, QLD and our first trip to Tasmania . 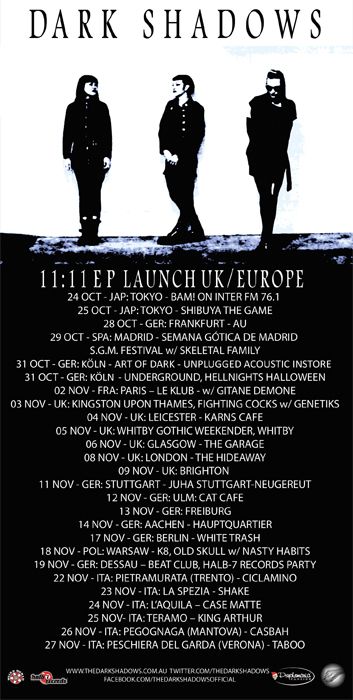 We’re also very excited to be embarking on our very first tour of Europe as well as a return trip to the USA . So look out world, we’ll see you soon!!! Brigitte Handley & The Dark Shadows will be supporting The Angry Tradesmen featuring Rob Hirst (Midnight Oil) & Dom Turner (Backsliders) when they launch their debut album, 'Beat the House' at the Manly Boatshed , Friday 19th September and Sunday 21st September at the Brass Monkey in Cronulla. The Dark Shadows will also be appearing as part of the Under The Blue Moon Festival, 'Local Legends' on Monday 29th September at the Sandringham Hotel , Newtown. Also on the bill will be winners of the Blue Moon band Massacre. Brigitte Handley & The Dark Shadows have just returned from a successful West Coast tour of the USA & Canada, where they played 27 shows in 30 days supporting Mad Sin (Germany) and Koffin Kats (Detroit). They are now gearing up for the launch of their new EP, ' Stand Off ' across Australia. 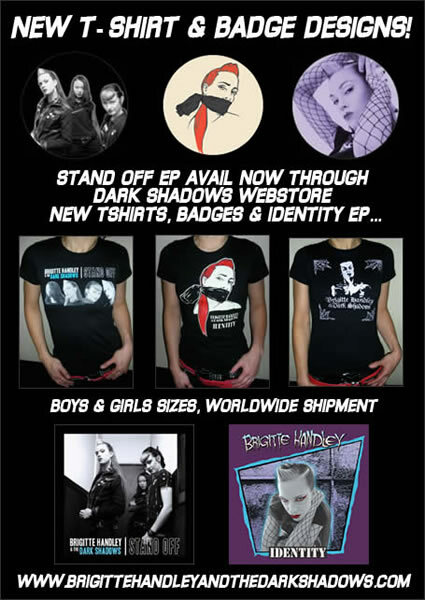 The ' Stand Off ' EP is now available online on the Dark Shadows webstore, iTunes, CD Baby and at the live shows. Sydney, Australia based, Brigitte Handley & The Dark Shadows will be heading off to the West Coast of the USA on tour with Mad Sin (Germany) and Koffin Kats (Detroit) to promote their new EP ‘Stand Off’. The tour includes 25 dates kicking off May 16th in Austin, TX winding up the West Coast to Vancouver BC and back down to Anaheim, CA. 09.03.08 - New EP in the works! Brigitte Handley & The Dark Shadows are currently in the studio working on a new EP and preparing to tour alongside Mad Sin and the Koffin Kats in the US in May/June 2008. They will be playing a few Sydney shows as well and heading up to Brisbane/Gold Coast and Canberra before they head off! Check the gigs page and myspace.com/brigittehandley for details. 10.12.07 - Contact Libertalia Entertainment for US Bookings!! 01.11.07 - Supporting The M3T3ORS (UK)!! After 5 weeks rockin' on tour with The Rezurex and The Quakes , Brigitte Handley & The Dark Shadows are back and are very excited to announce they will be supporting the godfathers of psychobilly, The M3T3ORS (UK) at The Annandale Hotel on Sat 24th November and ALL AGES show on Sun 15th November 2pm at The Warehouse , 9 Bridge St, Rydalmere. 18.06.07 - New Film Clip! 01.05.07 - ‘Identity EP’ is at No. 4 on 4ZZZ, Brisbane this week!! Brigitte Handley’s ‘Identity EP’ is at No. 4 on 4ZZZ, 102.1FM Radio in Brisbane this week!! Thanks to 4ZZZ for spinning it and everyone who has requested songs from the EP!! 29.04.07 - Dark Shadows Return to Melbourne! 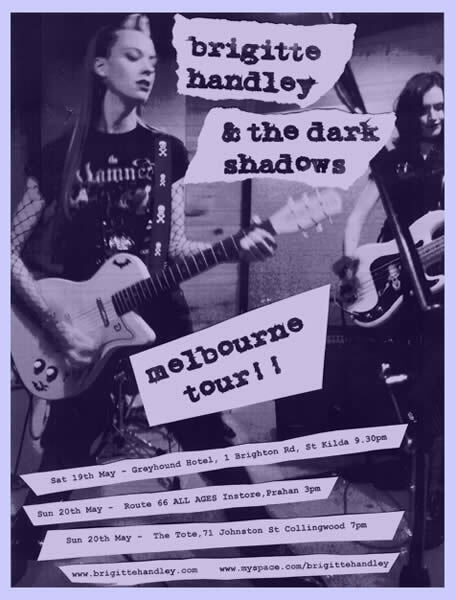 Since the launch of their 'Identity EP' and recent Sydney & Brisbane tours, Brigitte Handley & the Dark Shadows are very excited to announce that they will be heading back down south May 19th - 20th to play a string of Melbourne shows. 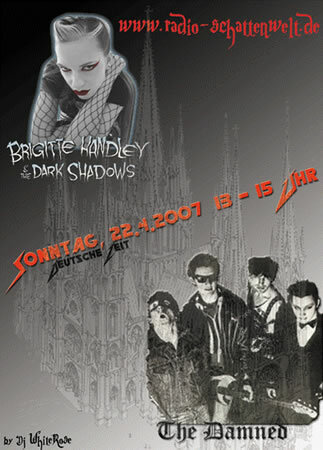 18.04.07 - Dark Shadows & The Damned Featured on German Radio! Click the link to "Wer ist onAir?" on Left Hand side of page. There will be our icecast2 status with the Name of the dj who is sending. Click on DJ ‘Whiterose’. There you can click on "click to LISTEN", save the m3u or open it with a player. 22.03.07 - QLD tour - VENUE CHANGE - Sat Night!! THERE HAS BEEN A LAST MINUTE CHANGE TO THE QUEENSLAND TOUR SCHEDULE! – THE SAT NIGHT SHOW AT ST MAGDALENE’S HAS BEEN CANCELLED DUE TO UNFORSEEN CIRCUMSTANCES! 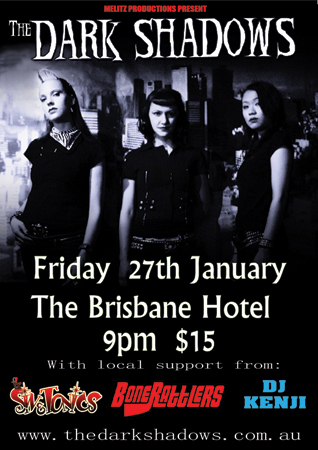 Brigitte Handley & The Dark Shadows will now be performing at The Jubilee Hotel , in Fortitude Valley, onstage 6.30pm . It’s a FREE show right across from the Overcranked Festival and kicks off at 5pm. A big thanks to Chris from Blue Moon Festival & The Pints for helping out with organising this show at such late notice! 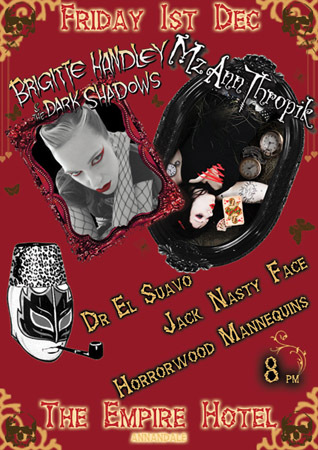 8.03.07 - BRIGITTE HANDLEY & THE DARK SHADOWS - RETURN TO QLD!! 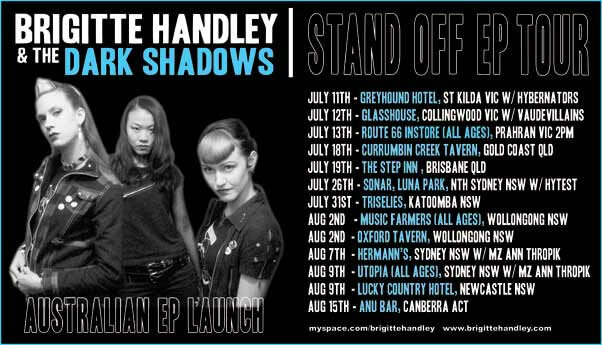 After the success of their tour to launch the 'Identity' EP in January, Brigitte Handley & The Dark Shadows are excited to announce that they will be heading back to Queensland at the end of March 2007 to play some more rockin' live shows... Check the Gig Page for more details. 25.02.07 - *ALL AGES* 'Identity EP' Launch party - Instore Utopia, Sat 3rd March!! Brigitte Handley & The Dark Shadows have a very special event coming up!! It’s the official *ALL AGES* Launch party for their ‘Identity EP’ which will be held Instore at Utopia on Sat 3rd March, 2pm !! 2006 was such a busy year for the band, there was hardly had time to organise an official party to celebrate the release of their EP! To rectify this, Brigitte Handley & The Dark Shadows have organised a special ALL AGES event, instore at Utopia Records , ( 233 Broadway, Next to Broadway Shopping Centre. Across from Victoria Park) Saturday 3rd March, 2pm . A great line up of bands have been organised for the afternoon, including ‘Darkest Day’ , ‘Topnovil’ & ‘Jack Nasty Face’ . So it’s gonna be an action packed, rockin’ afternoon and it’s FREE!! We’ve decided it’s time for the Dark Shadows to start their own Street Team and we want you to help us out! We’re looking for recruits to help spread the word to friends at school, gigs, hand out flyers, put up posters in your local area etc. Of course you will be rewarded by getting your own special badges, stickers, posters and other bits and pieces along the way as a thankyou for all your hard work. We’re gonna try and play as many All Ages events as possible this year so everyone can come along and rock out! So if you’re organising gigs for your school or community youth group or whatever, drop us a line and let us know! If you’re keen to be part of The Dark Shadows Street Team, send us a message to: "Street Team" and let us know why you’re the best for the job. At the moment we’re looking for people in the Sydney, Brisbane/Gold Coast and Melbourne areas. 30.01.07 - QLD Tour Diary!! Thanks to The Wrath boys & their crew and all the bands & everyone who helped out & came to our shows. Can’t wait to get back up there again in March! Next show is this Sunday at the Tokyo Joe fashion launch. It's at a ‘top secret’ location so you need to RSVP if you wanna come along. Check the Gigs page for details. 12.01.07 - Brigitte Handley & The Dark Shadows QLD Tour!! 12.12.06 - Dark Shadows Webstore online now! 19.11.06 - A night of Magic, Shadows, Horror & Sin - 1st Dec, Empire!! 17.11.06 - BH&TDS to feature on the latest Bleeding Edge Podcast!! The best way to hear it is with iTunes. If you have iTunes installed on your computer you can subscribe directly by CLICKING THIS LINK FOR YOUR PODCAST NOW That way, you will enjoy the Podcast PLUS if you have an iPod, you can take your show, and all future Bleeding Edge Podcasts with you as they are downloaded automatically! 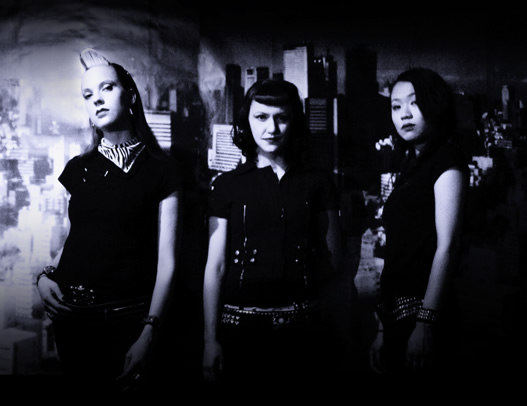 27.10.06 - Brigitte Handley & The Dark Shadows to play @ Peats Ridge Festival!! It’s been a great week for Brigitte Handley & the Dark Shadows with the exciting news that they will be opening the show for Slim Jim Phantom at the Gaelic Club, November 9th and now it’s just been announced that Brigitte Handley & the Dark Shadows have been confirmed as part of the line up for the Peats Ridge Festival in Glenworth Valley (only an hour up the F3 from Sydney). They will be performing on the Underworld Stage at 12.30pm on Saturday 30th December. 06.10.06 - Brigitte on Naked City - FBI & Asylum TV! Tune into Naked City on FBI 94.5FM 11.00am, Saturday 7th October to hear Brigitte being interviewed by Coffin Ed. Whilst in Melbourne, Brigitte was interviewed for Asylum TV on Channel 31 . You can see the repeat of the interview this Saturday at midnight in Melbourne and 10pm Monday night in Sydney. 22.09.06 - Alien Movies on Rage (ABC TV) Tonight!!! Forget the early night, turn that dial to the ABC after you get back from your night out & party on!! For the second week in a row, the film clip for 'Alien Movies' will be played on 'RAGE' between 2am-2.30am. 19.09.06 - Alien Movies on Rage & Melbourne Tour Dates Announced!! The film clip to ' Alien Movies' was shown on Rage (ABC TV) last Friday night!! Keep watching the new releases as hopefully it'll be on again soon! Brigitte Handley & The Dark Shadows will be heading down South to tour Melbourne at the end of September. They'll be headlining at the Ding Dong Lounge for the launch of the Rock-a-Horror compilation they feature on, released by 'Backseat Betties Records' as well as opening for Mach Pelican's Album Launch and an ALL AGES show at Route 66. Check the GIG GUIDE for more details! 06.09.06 - 'Identity' on new Australian film soundtrack!! It's been a busy time for Brigitte Handley & The Dark Shadows with a load of rockin' live shows including the support slot for psychobilly legends, The Fireballs. They are now gearing up for a Melbourne tour and the independent release of their EP in Australia. The title track from the forthcoming EP 'Identity' has also been included on the soundtrack for the new Australian film "48 Shades". 18.08.06 - THE FIREBALLS SPECIAL GUESTS!! 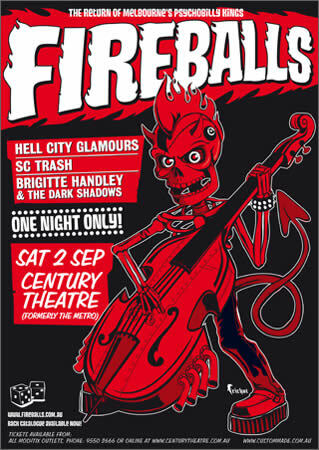 We are very excited to announce that Brigitte Handley & The Dark Shadows have just been confirmed as the special guests for 'Melbourne's metalrockpunkrockabilly gods' THE FIREBALLS, along with 'The Hellcity Glamours' and 'SC Trash' at the Century Theatre (Formerly Metro Theatre) on Saturday 2nd of September. Brigitte Handley will be performing as one of the guest vocalists for a 'Burlesque Tribute to Elvis' night at 34B, Oxford St, Darlinghurst to commemorate the anniversary of his death. 'Brigitte Handley & The Dark Shadows will be doing a live 'unplugged' performance at the launch of fashion label 'Tokyo Joe', Sat. 29th July, 5pm at Shock 'n' Awe, Brown Street, Newtown (just off King Street). "Tokyo Joe is all about everything that's fast, real and alive about underground fashion in a mainstream world. 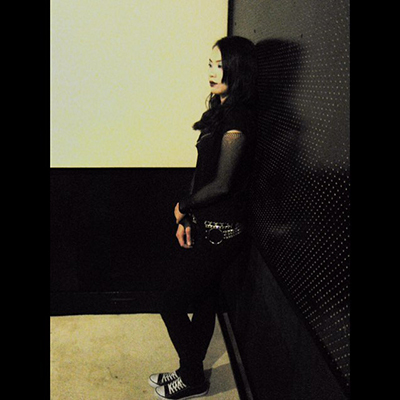 We are The Rock 'n Roll Riot Society." Tokyo Joe is designer Kylie Reynolds and artist Faye Praongde. 01.05.06 -Dark Shadows - DEMO-lition Derby! 'Alien Movies' has been chosen for the inaugural Sinister Muse Records DEMO-lition Derby. The "derby" is a month-long online battle of the bands that features one song from four artists. The derby starts on May 1 and will end at midnight (US Central Standard Time) on May 30.
a UK based radio show that you can listen to online. The show can be downloaded at www.punkyradio.com or there's a 3 minute promo on their myspace profile www.myspace.com/punkyradio. 22.03.06 -Check out the Alien Movies Clip on Myspace!!! We've added the film clip for Alien Movies to 'You Tube' and posted it on our myspace page for you to view. 01.03.06 - Brigitte Handley - IDENTITY EP, available now!! Brigitte Handleys new EP, Identity has just been released through Revel Yell Music, Japan. The EP contains 5 rockin tracks and bonus film clip! Were very excited to announce that Brigitte Handley & The Dark Shadows will be opening the show for Japanese garage rockers THE 50 KAITENZ and seminal Japanese/Australian bop punk stars MACH PELICAN, Sunday 12th March at the Empire Hotel, Cnr of Johnston St and Parramatta Rd, Annandale. Direct from Osaka, Japan, dressed in matching blue slim suits, set their hair like Beatles or Ramones, Danny (G/Vo), Dory (B/Vo) & Bogie (Dr/Vo) look just like the typical Osaka comedians. But once they jump on the stage, the whole room will be shaken down by their very entertaining energetic rocking typhoon! THE 50 KAITENZ are making their way to Australia for the first time celebrate a release of their debut album THE 50 KAITENZ No Gyaaaaa! ! (Warner Music Japan). 01.09.05 - Brigitte Handley on Myspace! Welcome to the new 'Brigitte Handley' website!! Here you will find info, pix, mp3s and all the latest goss on Brigitte and the band so keep checking back. If you'd like to keep in touch with all the rock'n'roll happenings, sign up for the the B-Grade mailing list to receive regular updates. Your details are strictly confidential and will only be used to inform you of up & coming events etc to do with the band. Brigitte Handley is back with a new sound, new band and EP! 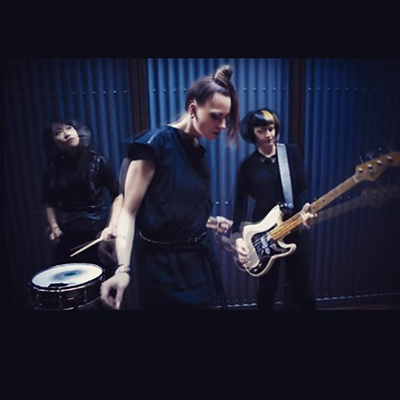 Apart from a few unplugged shows and guest appearances with Slant 6 and Jonny Gretsch's Wasted Ones, Brigitte took a break from the live scene to work on her new band and E.P. Now she's back rockin' on stage with fellow B-Grade girls, Carly Chalker, slamin' out on bass and Stella Mozgawa pounding away on drums.